Learn more about our dental implants! 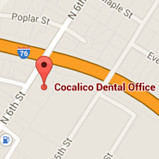 At Cocalico Dental, we offer gentle, family-friendly dentistry. Dr. William Funk, Dr. John Voler, Dr. Peter “Jake” Pranckun, and our dental team are passionate about creating healthy smiles for our patients. We focus on delivering painless, patient-centered care, and always emphasize minimally invasive processes that create the best results. We also stress patient education, to help people understand the connection between oral health and overall body wellness, as well as preventive care to keep one’s mouth healthy. Our team members are friendly and approachable: we love building long-term relationships with our patients, and are honored to be caring for multiple generations. There is nothing we like more than helping our friends and neighbors develop healthy mouths and beautiful smiles. Our Denver dental office serves children, teens, and adults from Ephrata, Lancaster, Reinholds, and surrounding communities. For more information about the gentle dental care we offer, and to schedule an appointment for yourself or a loved one, please call. We look forward to meeting you, and starting you on the path to a wonderful and healthy smile!